← Are you dealing with your STUFF? The Heart Resonance Grid has been activated now simply because it is time for us all to be exposed to its loving vibration. As Heart Resonance has grown through the years, active practitioners have experienced an increase in their ability to handle greater levels of spirit energy. As a result, they naturally become subtler in vibration. This has had broad ramifications for their lives, such as: a greater level of sensitivity to energy in general; more intuition; and a clearer view of what is spiritually true within their lives and others’. They have become more aware, more realised. When I look back to when I first grounded Heart Resonance onto the planet, and the journey I have been on since then, my perception of why it is here all starts to make a lot more sense. Even how my spirit teachers have changed through this time also makes more sense. With each new teacher having been more intense in energy than the previous one/s, they have had a greater impact on my energy. Each spirit teacher has had a transformational impact on my life, stepping me further and further along my awakening. Everything has been geared towards building greater capacity and tolerance to higher spiritual light. The more spirit energy impacting on my body, the more conscious I have become, and this is the case for others who have the Heart Resonance transmission. It has been a gradual and nurtured process of expansion. If you look at what Heart Resonance was way back in the beginning, it was a healing system that worked on shifting vibration through entrainment. It started a shift within people into a more pure, truthful and positive vibration. After a period of time, once students evolved in their energies by using Level One techniques and energy, the Level Two or Practitioner Levels came along. This brought an increase in vibration and consciousness. In a sense, it stepped up the practitioners’ vibration, opening them up to greater, deeper opportunities and potentials to energetically shift into a more positive and loving place. Next, Level Three or Advanced Practitioner information came along. Once again, this intensified and raised consciousness and vibration even further. Recently, I grounded the consciousness and processes of the Master Class and now the expansion of the Grids. The process is continuing. The Grids’ energies are having a real impact on the deeper, more negative resistances held within. All people, myself included, who have been connected to the Grids, are experiencing release from levels we did not even know we had. In a sense, the last bastion of non-truth is now being impacted on and released. I see this as final preparation for ascension. Resistance is what drives all fear-based energies. It is what holds society on a whole in negative structures. Resistance is the cause of all burden, illness, stress and struggle. As new, higher levels of vibration have been grounded through the Heart Resonance system, it has brought with it more spiritual light and information. This has presented great opportunity to evolve and align to the planetary shift towards ascension. These days I see the Heart Resonance system as a preparatory energy to support the Light Workers amongst us. Those workers who are attracted to it are being energetically prepared to cope with the expanding energy shift caused by the ascension process. This will put them in the front seat in regards to being more balanced and open and to be of better service to the whole as we move more and more into ascension. It is preparing their energies to have a greater tolerance to the impact of energetic expansion. It is conditioning them to be more balanced, thereby enabling them to be more productive when the time comes to be called to service. Heart Resonance people who have attended all levels of Heart Resonance and who are actively working with it are, I believe, spiritually evolved Light Workers. They have incarnated in this lifetime and have been attracted to Heart Resonance to put them energetically in a healthy state to fulfil their ‘being of service’ role to mankind. We are all going through a process of being turned up in frequency—moving more towards love and leaving fear behind. This is what ascension is all about. The Grids’ energy, I believe, is compatible to this end and will support us all in this unfoldment. The universe is expanding by turning up ‘loved-based’ energies throughout all existence. All existence is becoming more realised of and in itself. God is becoming more present in all life. As a result, the planet is being awakened with divine light. Slowly but surely, this energy is literally pulling us out of the old world, fear-based, false reality and into a new love-based, truthful existence. Ascension is all about becoming aware of our truth, the truth that we are, and have always been, divine in nature and make-up. Ascension gives us clarity into what is real and what is not. There is no separation in existence. You are a part of everything and everything is you. When we all realise we are ‘pure love’ in nature and frequency, and that we are all ‘as one’, we can only feel joy for all life and experience. It has always been the lower vibrational field Earth has existed in that, until now, has clouded this truth, exposing us to the frequencies of fear. Earth’s lower vibration is a field full of man-made distortions and structures. Due to this fact, it is almost impossible to experience what is real—Love. This has prevented us from seeing who we actually are. You may wonder why this has occurred. Why have we got it so wrong? This has not been a mistake, however. There has, and always has been, a divine, positive and precise reason for all experience unfoldment. This also includes perceived negativity. If you have read any of my previous books, you most likely understand my view on this. Ascension is pushing us out of fear and into the new Golden Age of mankind. 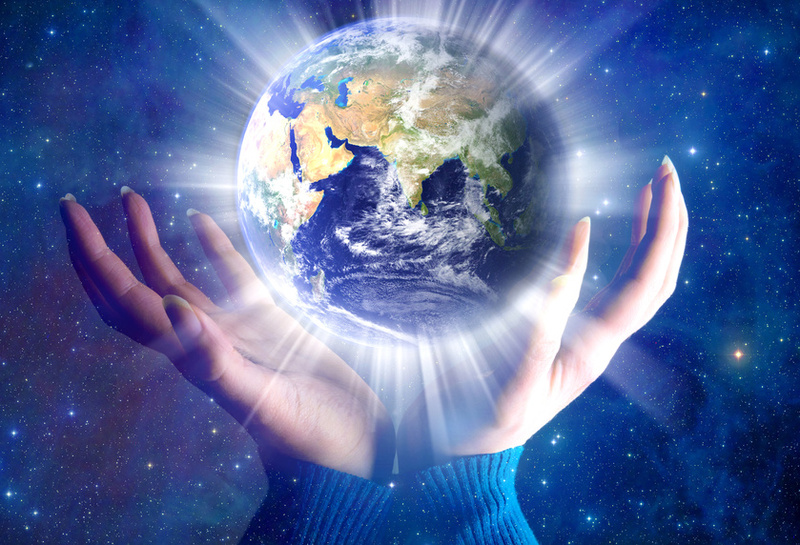 The new Earth will be a place of love and divine service, devoid of fear-based conditioning and perceptions. We all will help, love and support all life, knowing that all life is actually a part of us. So when we evolve to directly experience this newfound awareness, we will look for new ways to support others and ourselves. We naturally become loving of the whole. When we become subtler in vibration as the result of ascending into more light, we see more of whom and what we are—God. This will allow us to see how very special we all are and will motivate us all to love and honour what we are. This will then drive us to be of service in the most loving way to everything. The process of frequency amplification being created by the universe is being done in the most harmonious and supportive way it can. Little by little, new, higher energies are being directed to us from the heavens. Energy is given and then we are allowed to assimilate it and adjust, building greater tolerance to higher levels of divine light flow. Gradually, with each increase of light, we accelerate faster towards ascension, making us subtler in frequency. This in turn allows the universe to increase the volume of flow to us yet again. This creates a snowball effect in that by the faster it gets, the faster it gets faster. Expansion and awakening is then accelerated. We are all being stepped up in vibration at a tolerable level so as to allow our electrical circuitry and DNA to handle full ascension. The more energy we get used to, the less the step up will be at the final ascension point. The new, higher vibration of a love-based new world is much more intense in frequency than we currently can handle. Our DNA, electrical systems and even our cellular structures do not currently have the capacity to handle these greater flows of divine light and love. We have to evolve. In a sense, we cannot handle a higher, more pure love vibration. Our structures and circuitry are not designed for it. The exception to this is the younger generations that are now being born with the new, improved and updated systems. This is why many people under the age of twenty-five are more spiritually and emotionally sensitive. For the older generations, their whole system has to evolve and adapt to vibrationally match where they are heading—ascension and self-realisation. I see the Heart Resonance Grids as a way for the universe to support our system move through this process. It will help young and old to transition in a more harmonious way. It helps all who have received its vibration to drop resisting energies and to trust and allow more and more shifting energies and expansion. It is leading us to not have fear of the unknown where we are all heading. In a sense, the Grids are our love-based support system for our ascension. It will help nurture us through this process, as long as we actively use it. The new Heart Resonance Grids—personal and planetary—are tools to align us to be in harmony with the planet in its evolutionary shift to ascension. This entry was posted in Uncategorized and tagged Acension, consciousness, consciousness shift, enlightenment, Heart Resonance, higher consciousness, planetary ascension, starseed, trevor gollagher, universal consciousness, universal field. Bookmark the permalink.